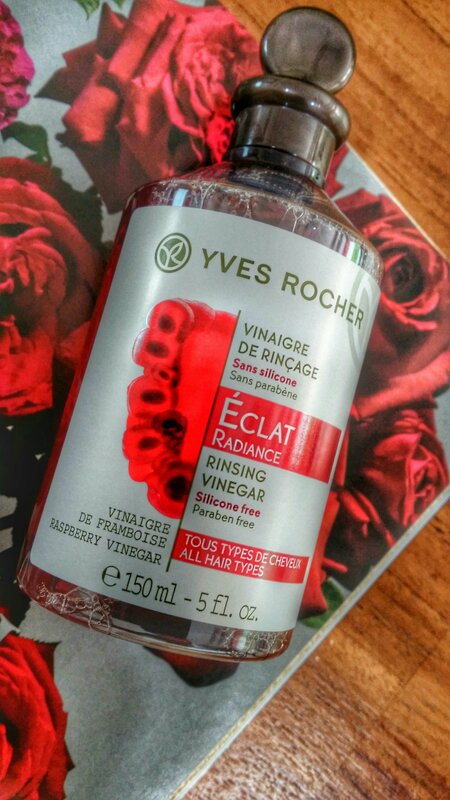 Hair rinsing vinegar, apparently a beauty secret of French grannies. What’s a hair rinsing vinegar? When I first saw that this was one of the top 5 selling products at Yves Rocher, I had to get it. After shampooing and conditioning your hair, you’re supposed to rinse the vinegar through your hair. Leave it on for a minute or two, then rinse it off with water for smoother, shinier and bouncier hair. I’m growing my hair out, so I’ll do anything to make them look perfect. If you think vinegar is disgusting and foul-smelling (i love vinegar by the way and drink a table spoonful of amino acid-rich Japanese brown rice vinegar every night), and cannot imagine using this, you’ll be surprised by this formula. It smells like raspberry compote, and I have to stop myself from licking it for a taste everytime I use it. And then my hair smells like sweet raspberries with a tint of vanilla for the rest of the day. It is also silkier afterwards, and looks less dry at the ends. There is a reason why it is granny-approved.